by Eugen Rosenstock-Huessy and Joseph Wittig. Reprint of 1927-28 edition, edited by Michael Gormann-Thelen and Fritz Herrenbruck, with a new afterword by Wolfgang Ullmann. 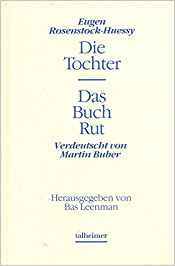 Verlag Klaus Boer, 1996. Hardbound (3 volumes), 1,320 pages. The Age of the Church is the communal testament of two men facing the end of an era. The first two volumes contain essays that span the history of the church, but the book is more than a collection of essays. Rosenstock-Huessy’s colleague at the University of Breslau, the church historian Joseph Wittig, had been attacked as "Luther redivivus" for his statements of doctrine in essays written for what he saw as a Catholic people living in fear of its own Church; he was eventually excommunicated. (The ban was lifted unconditionally twenty years later.) 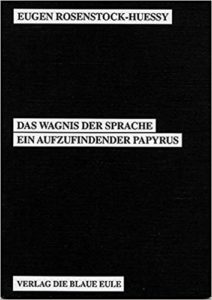 The third volume is a detailed documentary record of the events leading up to Wittig’s excommunication. In The Age of the Church, Rosenstock-Huessy writes that the true church knows no distinction between Catholic and Protestant; the Catholic holds order on the inside and endures chaos on the outside; the Protestant attempts to impose order on the world in order to allow his heart the fullness of freedom. That description fits the authors themselves: Wittig "kept order on the inside," first by demonstrating how doctrine sprang from and was revealed by truths discernible in everyday experiences, and then by remaining steadfastly Catholic in the face of general condemnation; Rosenstock-Huessy’s works record the progress of the Spirit through time an ordering of time to permit free growth into the future. Rosenstock-Huessy’s first great vision at Verdun saw the millennium of European history as a whole. His work with Wittig widened that span to two millennia, and lays out the unity of the times from Golgotha to the present. Das Alter der Kirche can be ordered commercially or privately. Private orders may involved used or remaindered books, but these may be less expensive. 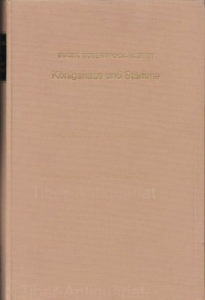 Das Alter der Kirche can be ordered commercially from Argo Books Verlag. by Eugen Rosenstock-Huessy. 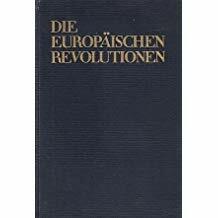 Brendow Verlag, Amandus Verlag, 1991. Other chapters address Augustine and the Christian virtues; the faith of scientists like Faraday; the legacy of his friend, the theologian and church historian, Joseph Wittig; and the place of the Jesuits in the battle for the importance of social groups and against the hegemony of the mind in human life. This reprint of a book published in 1952 presents the grammatical method as a tool to study times and eras. When the grammatical method is used, history appears as the economy of salvation. As a background, the book explores the paradigms that underlie theology and the natural sciences. The first chapters criticize theology, saying it should narrate not theorize, should function as a servant, not as a ruler. The middle of the book, chapter 5, "The Execution of God," addresses modern times. 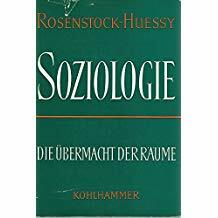 Chapters 6-11 use Paracelsus as an example to present Rosenstock-Huessy’s view of developments over time as the key events in the social sciences. "Language is wiser than he who speaks it," Rosenstock-Huessy often to used to say to underline the scope of language. Language contains the experiences and inspirations of the ages. The language that people speak and the great historical learning experiences in their cultures have developed in the same process. Language is at the core of Rosenstock-Huessy’s view of social reality. Die Tochter Das Buch Ruth	Series: "Texte aus der Geschichte." 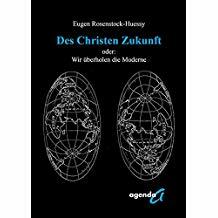 Rosenstock-Huessy approved the publication of his essay "The Fruit of Our Lips" twice in his lifetime: first, as the capstone of his two-volume retrospective of his works on language, Die Sprache des Menschengeschlechts, and in this troika of essays. 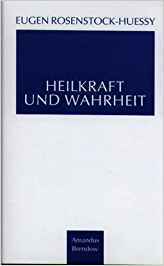 The first two essays have never appeared in English, though the first, "Im Kreuz der Wirklichkeit" ("In the Cross of Reality"), is the last chapter of the two-volume Soziologie (1958). 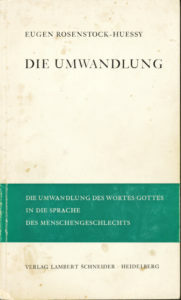 The second, "ICHTHYS: Leben, Lehre, Wirken," (ICHTHYS: Life, Teaching, and Action") was originally written as a polemic against the stand Franz Rosenzweig took at the end of The Star of Redemption; the version published four years later as part of Das Alter der Kirche (The Age of the Church) is neither polemic nor addressed to Rosenzweig. In the essay he not only makes the clearest statement of his understanding of Christ, but argues that the true nature of incarnation is the result of a modern (and entirely new) imitatio Christi, one that is primarily political in nature. 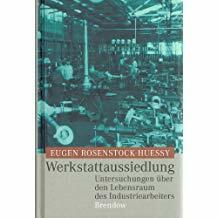 Rosenstock-Huessy confronted the fact that in destroying master craftsmen’s independent workshops, the Industrial Revolution had deprived them of both work autonomy and a valuable asset to bequeath. He declared the necessity of a kind of "industrial feudalism" to redress this loss. Stimmstein is the yearbook of the Eugen Rosenstock-Huessy Gesellschaft. Its name comes from Revelation (John 2:17). Every volume contains unpublished work by Rosenstock-Huessy, as well as a section presenting scholarly literature on Rosenstock-Huessy. 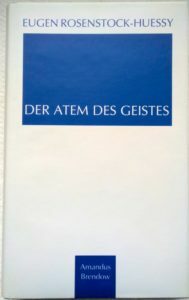 In addition to the regular volumes, the Eugen Rosenstock-Huessy Gesellschaft publishes supplements to Stimmstein. Stimmstein should be ordered through Argo Books Verlag (see page 62.) Volume 1 appeared in 1987 (ISBN 3-87067-317-6) and contains an essay by Rosenstock-Huessy on "Daughterly Thinking," a biography of Hans Ehrenberg and two of his essays, "The great Russians and our educational question" (1929), "Anonymity" (a sketch.) 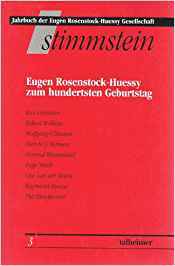 Volume 2, 1988 (ISBN 3-87067-338-9) contains Rosenstock-Huessy’s original handbook on work-service camps (1933), an essay by Wolfgang Ullmann on "New Thinking," and stories from the Eugen Rosenstock-Huessy-Huis. 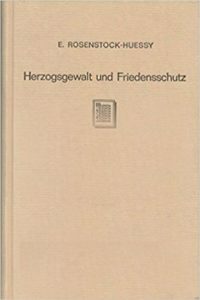 Volume 3, 1990 (ISBN 3-89376-010-5) contains the papers given at a conference held in 1988 in Würzburg in honor of Rosenstock-Huessy’s 100th birthday. Volume 4, 1993 (ISBN 3-89376-017-2) contains Rosenstock-Huessy’s 1944 essay "Mad Economics or Polyglot Peace." Volume 5 is planned for 1997. The subject is new models for universities. Stimmstein Supplement 1992 contains Rosenstock-Huessy’s essay "Hitler and Israel" in English, German, Dutch, and Polish. Stimmstein Supplement 1995 contains William James’ essay "The Moral Equivalent of War" in English, German, Serbo-Croatian, and Russian. It also has Rosenstock-Huessy’s essay "The Soul of William James" ("Die Seele von William James") from I Am an Impure Thinker, as well as "The Threat to History and the Danger of Barbarism" ("Die Geschichtsnot und die Gefahr der Barbarei") from 1932. MITTEILUNGSBLÄTTER DER EUGEN ROSENSTOCK-HUESSY GESELLSCHAFT The Mitteilungsblätter contain smaller works of Rosenstock-Huessy’s. 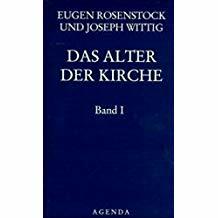 They also contain news items about the Gesellschaft’s activities and projects the Gesellschaft feels carry on Rosenstock-Huessy’s work. There is a section with reviews of scholarly and lay publications. The Mitteilungsblätter appear once or twice a year. They can be obtained by contacting the Gesellschaft’s business office.